Although all the methods we've already discussed for studying the Bible will help to draw you closer to God, a devotional study is the most personal and intimate. Its sole purpose is to bring you into a more familiar fellowship with God and into contact with deep spiritual truths concerning Him and yourself. As you are probably well aware, the more you apply the Word of God to your life, the more Satan  or more accurately, his demons  will fight you. They want to cause you to doubt God and His promises, to question your salvation or healing, to give in to a spirit of condemnation, to live in fear. In short, they want to make you feel discouraged, dismayed, and defeated. To do this, they devote themselves to creating spiritual conflicts within you. But, praise God! Jesus showed us how to deal with spiritual conflict. When Satan tempted Jesus in the wilderness (cf. Matthew 4:1-11, Luke 4:1-13), Jesus resisted him and fought back by using the most powerful weapon in the world: He quoted the Scriptures. The devil had to flee because there is no more powerful weapon with which to fight him than God's Word because it is truth and life. In Ephesians 6:17, the Word is called "the sword of the Spirit." Armed with God's Word, we are "able to stand against the schemes of the devil. . . . and having done all, to stand firm." (Ephesians 6:11, 13) The Word of God brings you cleansing, healing, and victory when you hide it in your heart. You may learn much from the Bible by using the study methods you have studied so far in this series of lessons. But to fully understand God's Word, you must study the Bible with devotion. Devotional study is the pursuit of Godly knowledge and wisdom for personal spiritual insight and growth. The word "devotion" is defined as "great love or loyalty", "strong love", and "attachment". You have probably seen stories, cartoons, or TV shows depicting a man reading the newspaper or watching a game on TV while his wife is trying to talk to him. As she talks, he mutters and nods his head every once in awhile. He's not intentionally trying to hurt her or ignore her; he's just more interested in the newspaper or game than he is in what she's trying to tell him. In much the same way, if we're not careful, we can do the same thing to God. Sure, we love Him! We serve Him daily. We testify and preach and pray all the time. Doesn't that prove how much we love Him? Does it....? The word "devotion" also means "an act of prayer in which one asks humbly and earnestly of God". Devotional study deserves and demands our full attention. How can we "abide in Him" and He "abide in us" if we're too busy to invest any time getting to know His heart for us? Devotional study helps to create a "oneness" or "wholeness" between you and Christ. In devotional study, you read a short passage of Scripture. You read it slowly, probably several times. You prayerfully think about what it means. You ask yourself, what does this passage say to my heart? Does it speak to my present need? How does it reveal Jesus to me? This process is called "meditating", which means to "think intently" or "reflect deeply on a subject". In other words, you are to read the same verse or passage until your mind is occupied with the meaning and with the presence of the Lord. The Word gets inside of you and feeds your soul. The written Word reveals Christ to us. He is the Living Word. The more we know the written Word, the better we know the Living Word! The better we know Christ, the more we will love Him and want to obey Him. King David meditated much on God's Word. He said, "My mouth shall speak wisdom; the meditation of my heart shall be understanding." (Psalm 49:3) When we are in Christ and Christ is in us, we are said to have "the mind of Christ" (cf. 1 Corinthians 2:15-16). Our meditation renews our minds. God wants us to share the Gospel with others. Thus, a main purpose for any Bible study is that it helps us to share God's truth with others. As we gain better knowledge and insight into God's truths, our desire to teach others automatically increases. David prayed, "Open my eyes, that I may behold wondrous things out of your law." (Psalm 119:18) This should be our prayer as we study how to make the message of God's Word personal and practical. Every passage of Scripture has a main truth. Often, there are other less obvious truths too. It is your task to find out what the Holy Spirit intends to say. Although no one can instruct you on how to meditate on God's Word in a personal devotional study, the following guidelines may assist you. "...devote yourself to the public reading of Scripture, to exhortation, to teaching." (1 Timothy 4:13) We must feed daily on God's Word to be spiritually healthy: "...his delight is in the law of the LORD, and on his law he meditates day and night." (Psalm 1:2) In Bible days, a group of Christians who lived at Berea were known for their love of Bible study (cf. Acts 17:10-11). They were more than listeners; they searched the Scriptures daily. We need to be as faithful in our study of God's Word as they were. 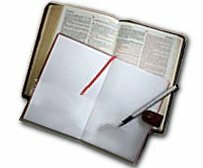 Write notes as you read and study the Bible. As this is a devotional study of God's Word, you might consider writing in a journal or diary the personal insights and thoughts you have as you read. Bible truth is clear and simple, but at the same time it can have some very deep meanings. The deep meanings of the Word are as "silver" and "hidden treasure" for which we must search in our studies (cf. Proverbs 2:4). Before interpreting the meaning of a passage, you need to relate it to its context. You need to read related teachings to help you find the harmony of each passage within the whole Word of God. As we learned above, "meditate" means to "think intently" or "reflect deeply on a subject". Take time to sit quietly and meditate on the Word. "Listen to what is wise and try to understand it." (Proverbs 2:2) The Holy Spirit will always bring some message to your heart as you take time to think about what you have read. If you follow the command of Proverbs 4:20-21 in your meditation, you will gain much insight into the heart of God and into your own heart. When you really "listen to God's words", they begin to change and control your thought life, and you learn obedience. Meditation opens your heart to God and makes you want to obey Him and express your love. True meditation challenges us and affects the way we live. Any study of God's Word that does not either challenge, convict, or change us is a waste of time. We must apply the truths to our daily lives. helps you to witness to others (cf. 2 Timothy 3:16). There are various ways we can put God's Word into practice. We must love our neighbor (cf. Luke 10:27)  not just the one you share recipes with or carpool with, but also the old man across the street who only growls when you try to be friendly or the one a couple houses over whose yard is so unkempt with weeds and trash. We must not judge our brother in Christ (cf. Romans 14:13. We must claim the promises God has made. It is not enough to know that we have been given full life in union with Christ (cf. Colossians 2:10); but we must receive into our hearts His promise of full life, and exercise our freedom in Christ (cf. Colossians 2:11-20). We must learn from the examples of others, good and bad, as we studied in "Character study". Above all, we must believe God's statements of truth and live according to them. To illustrate, the Bible teaches that we are one in Christ (cf. Ephesians 2:14-18), and that love is the thing that makes us like Christ (cf. Ephesians 3:17-19; 1 Corinthians 13). Our response to these truths will show whether or not we have applied them to our lives. Teaching begins in the home. We must teach God's Word to our children.(cf. Deuteronomy 6:7). We all can testify that it is a joy to have knowledge and to be able to pass it on to children, to young people, or to new believers. We must strive to be able to say what Jesus said: "My food is to do the will of him who sent me and to accomplish his work." (John 4:34) That should be our daily "food" [desire/prayer], too! God wants us to study the Bible as a means of devotion, strength, and joy for ourselves; but He is most pleased when we share it with others. Our love of God's Word makes us want to share it. The more we study the Bible, the more beautiful it becomes. The more we search it, the more it grips our hearts. Our belief in it brings unlimited blessing. Our living it adds joy and peace. Our sharing it with others demonstrates, again, its eternal power.